He said he didn't misspeak in his comments earlier in the week and suggested the media and critics read unintended significance into the remarks. "I was surprised by how finely calibrated every single word was measured," Obama said. "I wasn't saying anything that I hadn't said before." Obama has always said his promise to end the war would require consultations with military commanders and, possibly, flexibility. So you’d give the same rock-hard pledge, that no matter what the military commanders said, you would give the order to bring them home? OBAMA: Because the commander-in-chief sets the mission, Charlie. That’s not the role of the generals. Well, the president sets the mission. The general and our troops carry out that mission. And, unfortunately, we have had a bad mission set by our civilian leadership, which our military has performed brilliantly. But it is time for us to set a strategy that is going to make the American people safer. Now, I will always listen to our commanders on the ground with respect to tactics, once I’ve given them a new mission, that we are going to proceed deliberately, in an orderly fashion, out of Iraq, and we are going to have our combat troops out. We will not have permanent bases there. Once I have provided that mission, if they come to me and want to adjust tactics, then I will certainly take their recommendations into consideration. But, ultimately, the buck stops with me as the commander-in-chief. That is just one example of dozens I could give. The plain meaning of Obama's statement in the ABC debate is that Obama sets policy; the military commanders just set tactics. Clearly Jennifer Loven is distorting the public position Obama has held during the primaries, and is lying to readers by claiming readers Obama has "always" been consistent. Oh, by the way, Jennifer Loven happens to be married to a former Clinton administration official. FYI, since the blogger's boycott began last month, I have avoided linking to any Associated Press articles, but I make an exception today because of Jennifer Loven's grotesque spinning. I'll call it the Loven Exception. "... Loven has a long history of exhibiting Bush Derangement Syndrome on the job – here, here, here, here, here, here, here and hereLoven is married to Roger Ballentine — a former Clinton adminsitration official and vocal supporter of John F. Kerry’s presidential campaign." Jennifer Loven has now destroyed any credibility she ever had (if any) as an objected reporter. She could not resist taking a shot at the so recently deceased Tony Snow by suggesting that he did not have a command of the facts. Like she does! Partisan hackery is always unprofessional for a reporter; in an obituary piece, it's beyond disgraceful. 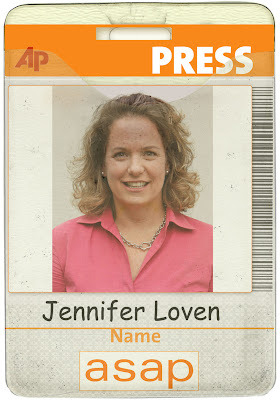 That the AP would keep her suggests a lack of objectivity by that organization. Jennifer Loven does not carry water for anybody. She is one of the more earnest reporters covering the political beat in America. If you do not like what she has to say, perhaps you just don't like reading the unvarnished truth. I agree she does carry water for Obama. Just read one of her articles and noticed all the inaccuracies. Googled her name and found all sorts of comments and blogs like this. Below is what she said about Palin and McCain. Clearly an leftist slant. _Palin routinely claims to have put an end to Alaska's infamous "bridge to nowhere," even though she supported the project during her gubernatorial campaign and turned against it only when it became a national embarrassment and Congress threatened to cut its funding. _Palin has claimed that she put the governor's jet on the Internet auction site eBay, and McCain has said it was sold at a profit. However, the jet was never sold via eBay. _Palin says she eliminated the governor's chef from the state budget, yet she gave the person another job in state government. "Obama has always said his promise to end the war would require consultations with military commanders and, possibly, flexibility." What is your definition of "promise to end the war"? To me, maybe I'm wrong, it sounds like an all encompassing statement describing the process of ending the war. Nowhere in that sentence does the author separate or mention policy and tactics. In fact, one would think that "ending the war" includes both policy and tactics. Being that the generals are in very much involved in the tactics, according to the debate statements, that would mean that the sentence is not a lie. I haven't had time to read the author's other stuff, but this particular sentence in question does not seem like a lie to me. Also, to anonymous, how are those statements about Palin inaccurate? Please explain. Factcheck.org has confirmed each of those statements about the bridge to nowhere, the jet not sold on ebay and the chef that was not really fired, just reassigned. Please explain how they are not accurate? Is Factcheck leftist, too? Even though they routinely debunk Obama as well? I'd heard of media bias - but see Jennifer Loven's AP article today titled "Obama passes first national security test". What was the test? No, not the gowing Iranian nuclear threat and no, not the North Korean's lobbing a 3-stage ICBM over Japan. It was the the take down of the 3 Somali pirates in a lifeboat!! Hey, I'm glad we did it and I'm even more glad the Captain is safe - but this was not a test of national security.